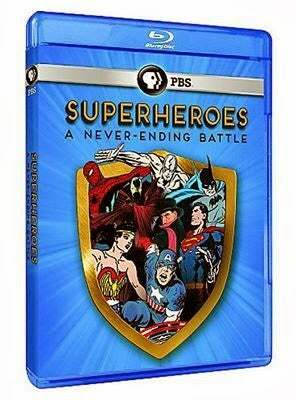 Did anybody catch that superhero documentary on PBS last night? I really only have a couple of reservations with the documentary. First of all, most of the creators interviewed have had their characters made into movies so there can be clips from Superman, Dark Knight, X-Men, Spider-Man, The Avengers, et al. — even the dreadful FF movies. Also, if you're dead, like Jack Kirby, or publicity shy, like Ditko, you're only going to be represented by brief archival footage or stills. (Alan Moore is represented only by a clip that must be at least a quarter-century old.) On the other hand, the film is three or four years in the making, which means that many of the older creators interviewed here, like Infantino or Kubert, are no longer with us. There's also a decided lack of focus on the inner workings of the industry or creators' rights. Kantor touches briefly on how Siegel and Shuster were screwed out of the rights to Superman, and how they were lated recompensed by Warner Communications, but that's it. (Nothing about the painful, protracted battle that their heirs pursued into the current century without success.) Jack Kirby gets frustratingly little attention beyond some clips from conventions in the '70s and '80s. The emergence of creator-owned comics is touched upon briefly, but it's mainly to give McFarlane a chance to ramble on interminably. (Certain creators, such as Gaiman and Mignola, are conspicuously absent, but I suppose that's because they're not known primarily for superhero comics — or maybe they just weren't available.) The focus is almost exclusively on Marvel and DC; if you knew nothing about the industry before seeing this movie, you'd never know about all the independents that sprang up in the '80s thanks to the rise of the direct market. But on the whole, the presentation is very solid, very respectful —even reverential— to the subject matter. If you have a friend, relative, spouse, or significant other who just doesn't get your comic book habit, the least you could do is recommend this documentary. Also, it's hosted and narrated by Liev Schreiber, who looks as if he wants to murder the camera operator at all times. The whole program is online, for a limited time, as well as various physical and digital media. There's also an attractive coffee table book.